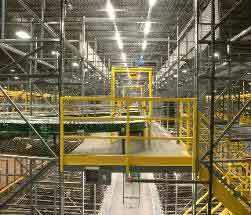 Heavy Duty Used Pallet Racks & Used Warehouse Rack. Used heavy duty pallet racks allow for the consolidation and streamlining of inventory management—at up to 40% less the cost of new racking systems. The complexities of auto parts, paper products, liquids, and tire storage can be systematically and cost effectively addressed with Easy Rack used heavy duty pallet racks. An enormous diversity of decking, dimensions, and weight capacities is only a phone call away for the warehouse or factory that requires heavy duty shelving, storage space, heavy duty racking, and boltless designs in long span storage racking. All of these components and systems can be purchased in excellent, used condition and utilized for maximizing both your square footage and your vertical cube space for expanded storage. The boltless design offers a superior, safer support structure that will not bow in the middle when a large amount of weight is placed on top of it. Used Boltless heavy duty pallet racking gives organizations extra warehouse space for large and bulky materials in a reliable and safe design that can be utilized for a wide variety of industrial storage needs. These used heavy duty pallet racks assemble with snap together parts that require no clips, bolts or tools. They are specifically designed for loading heavy bulky materials with a forklift or pallet jack. 1. The teardrop style, heavy duty pallet racks is the most commonly used design. 2. The 2” adjustable range allows for flexibility in height usage. 3. Standard Widths measuring 64" & heights to 300" to cover most heavy duty storage applications. 4. Heavy channel bracing soundly welded to height tensile steel columns creates strong & reliable upright truss. 5. Safety is assured and assembly and adjustment are ensured by the boltless design. 8. Weight capacities to 35,000 lbs. based on 54" beam spacing. 9. All teardrop style used pallet rack components are designed in accordance with the Rack Manufacturer's Institute and conform to light gage cold form standards. What to look for when buying heavy duty used pallet racks and storage systems. Insurance plays a critical factor anytime a company invests in either new or used heavy-duty pallet racks. Ruggedness and safety are key issues to discuss in detail with your commercial insurance agent. Making certain that you comply with all industry standards will work toward minimizing liability when using heavy duty storage racks. One very important thing to pay attention to is local fire codes. Many areas of the country now require wire decking to be used in heavy duty pallet rack systems because steel and wooden decking will block the water coming from ceiling sprinklers in the event of a fire. While steel decks are recommended for the heaviest duty industrial storage needs, there are many storage applications where used wire decking will do just as well and also keep your facility in full compliance with regulatory agencies. Again, this is a matter to discuss with your commercial property insurance agent to make certain you are both legal and OSHA compliant in your procurement. Easy Rack specialists will work to fulfill your storage needs to the full satisfaction of the law and your inventory process flow. Easy Rack carries a wide variety of commercial shelving, material handling equipment, used pallet racks, netting, used pallet racking and modular prefab buildings installed nationwide. If you can not find what you are looking for call us toll free at 1-888-776-3720 and we will find it for you. Our home office is located in Houston, Texas with warehouses located throughout the United States that enable us to service all 50 states including New Orleans, La., Cleveland, Ohio, Kansas City, Mo., Mesa, Arizona, Virginia Beach, Va., Omaha, Nebraska, Oakland, California, Miami, Florida, Tulsa, Oklahoma, Minneapolis, Minnesota, Colorado Springs, Colorado, Arlington, Texas, Beaumont, Texas, Denton, TX, McKinney, Texas, Midland, TX, Killeen, Texas, ALBQ, NYC, LA, MPLS.